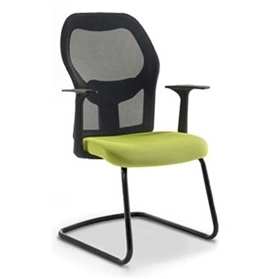 A deluxe 'active' mesh back provides luxurious, yet responsive support, able to adapt to each user's back, offering high levels of seating comfort. Simple finger-tip adjustment ensures that the perfect posture can be achieved from the seated position, while the option of seat depth adjustment and height adjustable arms enable the Mesh chair to be 'tailored' to your exact requirement. The sophisticated mesh back provides superior support and allows the free movement of air around the user's back keeping them cool and comfortable in all conditions. 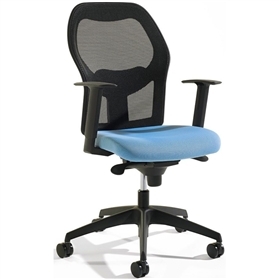 Standard chair has a high back with permanent contact back mechanism, tension control and black mesh back, black frame and base. The synchronised movement mechanism allows you to have the chair unlocked and moving with you. This encourages movement which is good for your muscles and blood flow.